Ghana's football team is due to receive a heroes' welcome on their return home from the World Cup in South Africa. The government is urging people to put aside their disappointment at the controversial quarter-final loss to Uruguay to hail the Black Stars. Africans rallied behind the Black Stars as the continent's only team to progress beyond the group stage. On Sunday, the team was cheered as they toured Johannesburg having earlier met former President Nelson Mandela. It is the first time the World Cup has been played in Africa, and many had hoped an African squad would progress to the semi-finals. The Ghanaian government is laying on drummers and singers to welcome the Black Stars at Accra airport on their return. 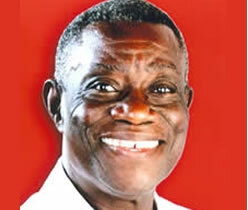 President John Evans Atta Mills urged Ghanaians not to "nail them" despite their disappointment at the loss. "We should rather continue to support them and show appreciation for what they have achieved," he said. "In Friday's match, there was going to be only one winner and unfortunately, it was not the Black Stars." He said the team had held high the flag of Ghana and "we must be proud of our senior national football team for the honour done us". Ghana were drawing 1-1 with Uruguay when in the final moments of extra time striker Asamoah Gyan missed a penalty kick awarded after Uruguay's Luis Suarez blocked a goal-bound shot with his hand. The Black Stars then lost to Uruguay in a penalty shoot-out. Crowds gathered to cheer the team on Sunday as they toured Johannesburg. The Black Stars met former South African President Nelson Mandela. On Saturday the team met Nelson Mandela's ex-wife Winnie Madikizela-Mandela in Soweto, before visiting Mr. Mandela at his home in Johannesburg. "They represented the continent well and although they did not qualify for the semi-finals they can return home with their heads held high," said Mr. Mandela's office after the meeting. Leaving his house, the players described meeting the Nobel laureate. "I am very happy to meet a great man like President Mandela. I was there with him, shaking his hand. I'm so happy to meet him face to face," said goalkeeper Richard Kingson. Kevin-Prince Boateng said: "It's a dream come true, you know. It is very, very good for us. We feel happier and feel good that we have met this man. He is a legend."